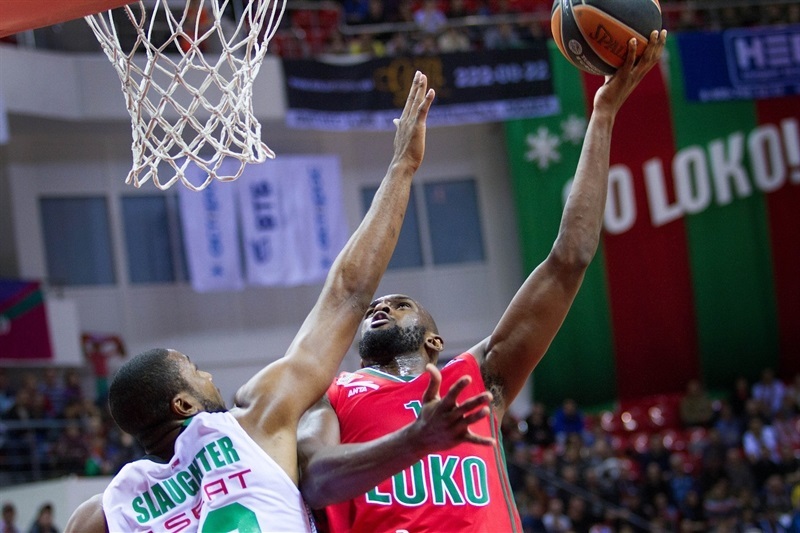 Lokomotiv Kuban Krasnodar remained in second place in Group E after a comfortable 82-58 win over visiting Darussafaka Dogus Istanbul on Friday. Lokomotiv improved to 5-2 at the halfway point of the Top 16, while Darussafaka remains in last place in with a 1-6 record. 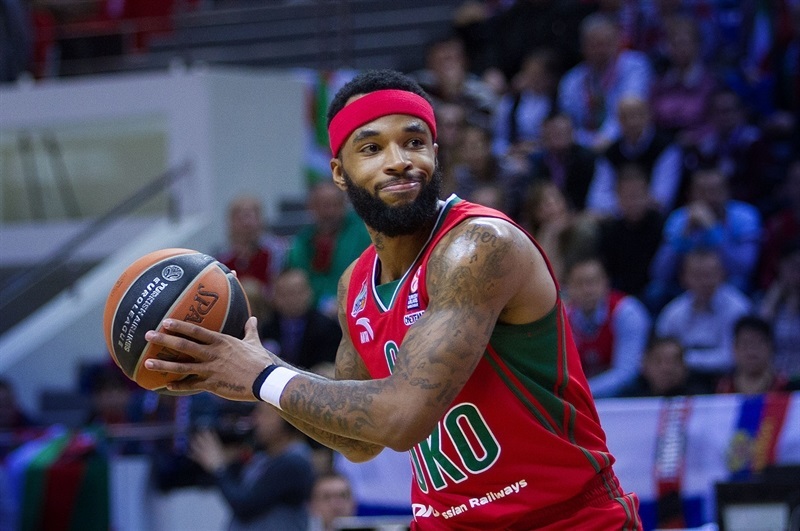 Lokomotiv took the lead for good midway through the first quarter and pulled away with a strong finish to the first half when Anthony Randolph and Malcolm Delaney fueled a quarter-ending 13-2 run to build a 44-28 halftime lead. 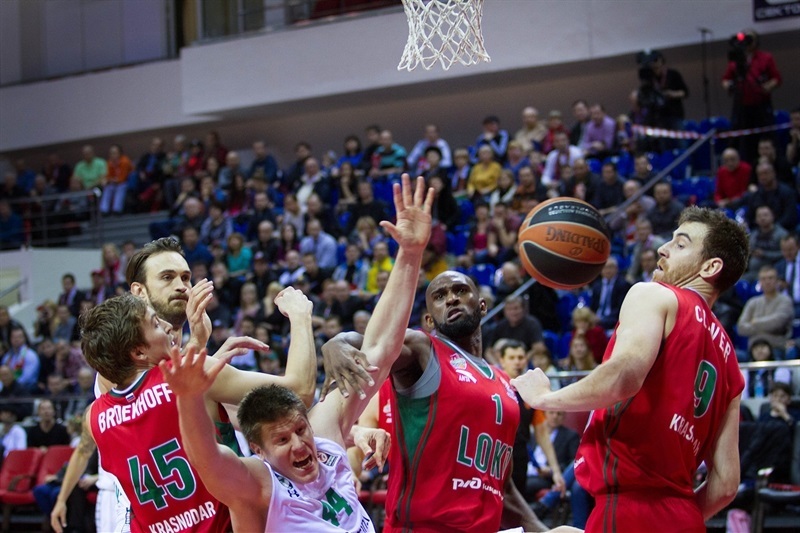 An 11-0 run at the start of the third quarter broke the game wide open, and Lokomotiv led by as much as 57-31. 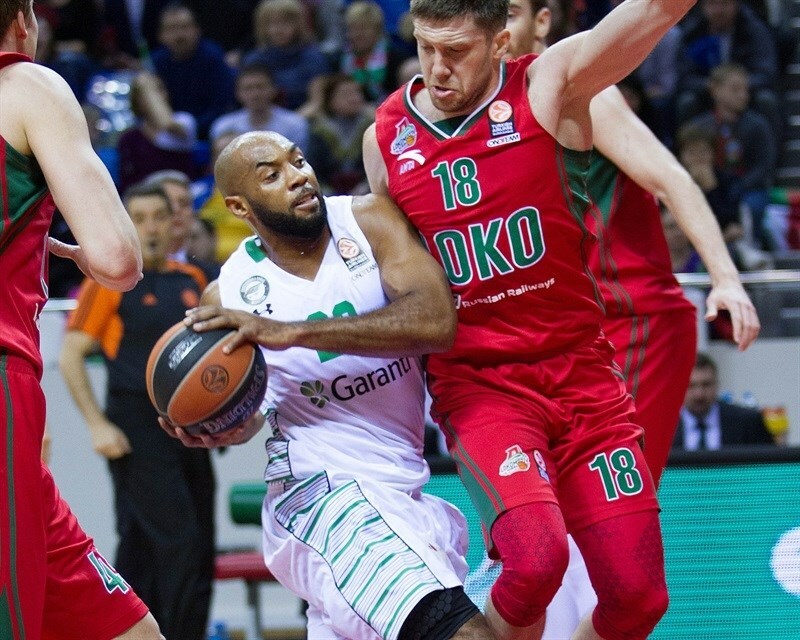 A 3-16 run behind Scottie Wilbekin gave Darussafaka a chance and cut the deficit to 61-50. 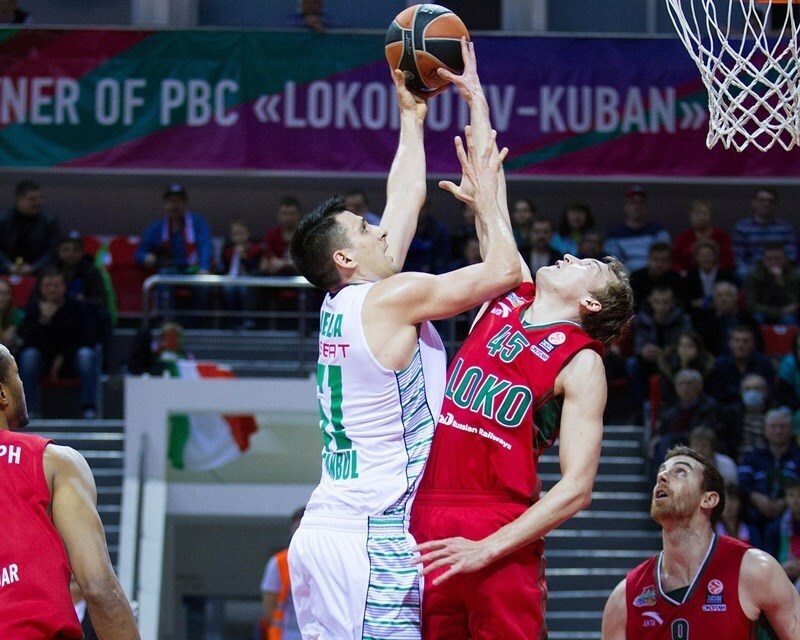 But, triples from Ryan Broekhoff and Evgeny Voronov sealed the outcome for the hosts. Randolph paced the victors with 18 points, Delaney scored 16, Voronov 14, while Chris Singleton chipped in with 11 plus 8 rebounds, and Broekhoff with 10 points. Scottie Wilbekin netted 19 for the visitors, and Emir Preldzic finished with 11 points, 7 rebounds and 5 assists. 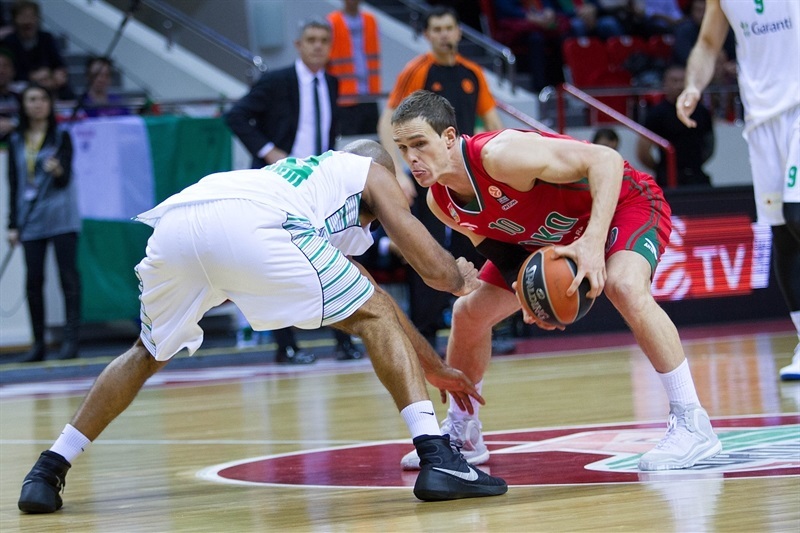 Semih Erden scored 9 in defeat. 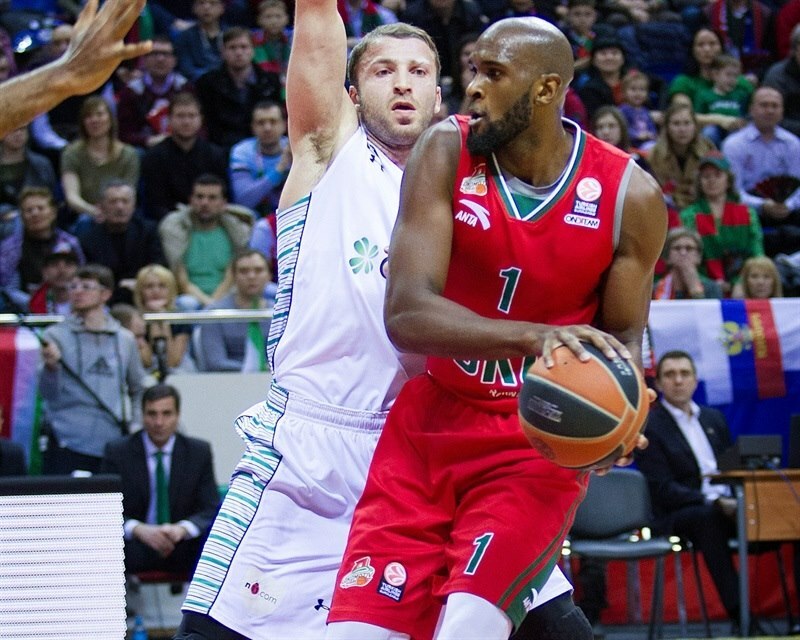 Milko Bjelica opened the scoring with a steal and fast break layup for Darussafaka, but Lokomotiv countered with a layup through contact by Voronov and a three-pointer from Delaney. Reggie Redding’s triple made it 5-5 before Voronov and Bjelica traded layups. Randolph hit a baseline jumper, and Voronov scored on a fast break to give the hosts an 11-7 edge. Erden made a hook shot and later split free throws to help tie the game, but Randolph scored a layup and Singleton buried a jumper to open 17-11 advantage. Wilbekin made a three-point play before Singleton and Lake Harangody traded jump shots to end the quarter at 19-16. Broekhoff opened the second quarter with a triple, and after Delaney and Manu Markoishvili traded baseline jumpers, Andrey Zubkov scored a layup following a scramble after a loose ball for an 8-point lead. After a timeout, Wilbekin hit a long three, but Sergey Bykov answered right back with a three for Lokomotiv. Zubkov’s free throws extended it to 31-21, but a triple by Preldzic and a huge dunk by Erden halved the deficit to 31-26. After a Lokomotiv timeout, the hosts collected 3 offensive rebounds on the same possession before Singleton fought his way for a put-back-plus-foul, which ended a drought of more than three minutes without a field goal. Singleton’s mid-range jumper restored a 10-point margin, and a corner three from Randolph made it 39-26 entering the last 60 seconds of the half. 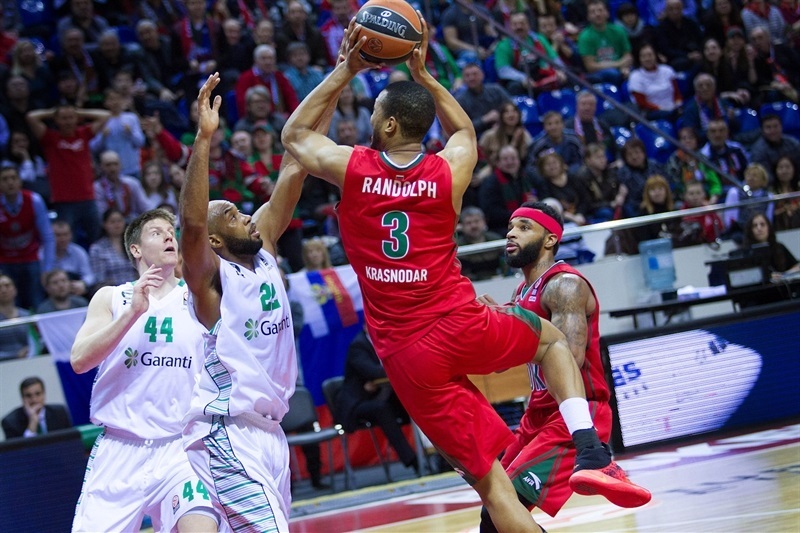 Erden had a dunk at the other end, however Delaney nailed a three-pointer, and Randolph made a steal in the waning seconds and raced to beat the buzzer on a fastbreak, giving Lokomotiv a 44-28 cushion at halftime. Erden made 2 free throws, but Voronov’s long jumper and Randolph’s three-point play extended the hosts’ margin to 49-30. Randolph scored twice more inside to break the 20-point barrier, followed by Delaney shaking off his defender to lay it up high off the glass and make it 55-30. The visitors were kept without a basket for almost five minutes before Marcus Slaughter made a pair of free throws, which snapped an 11-0 run. Randolph banked it in from a tight angle, while Marcus Slaughter and Preldzic made 3 of 6 free throws for Darussafaka, which tried to get something done defensively by playing zone defense. Wilbekin drained a triple, for the visitors’ first basket in the third quarter after seven minutes, 57-36. 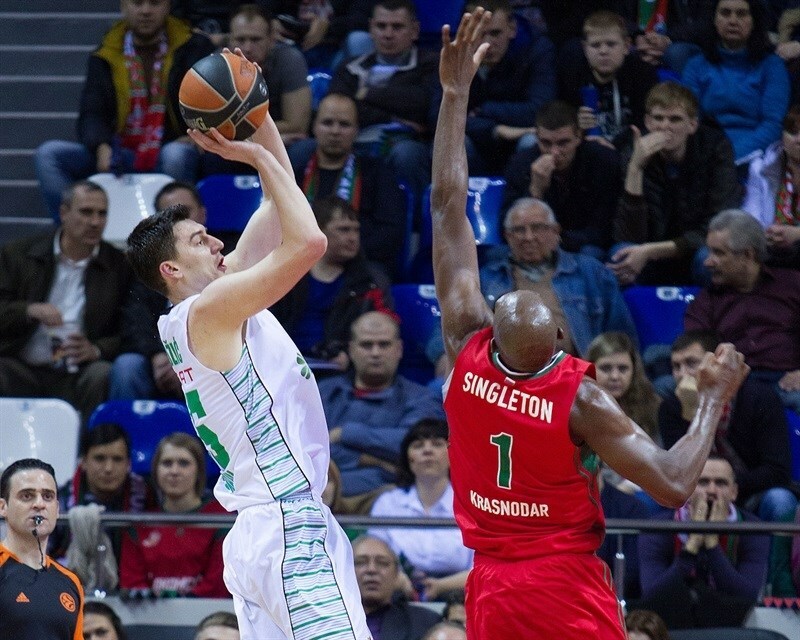 Lokomotiv coach Georgios Bartzokas called a timeout, and while Darussafaka’s Preldzic and Slaughter went 3 of 4 from the foul line, Lokomotiv remained without a basket for another two minutes before Bykov nailed a second chance three-pointer to make it 60-40 after three quarters. Slaughter scored an alley-oop dunk, and Darussafaka forced 5 turnovers in the opening three minutes of the quarter, but that only led to one fastbreak layup from Preldzic. Wilbekin’s triple cut it to 60-47, and after split free throws from Voronov, Wilbekin buried a corner triple to get Darussafaka within 61-50. 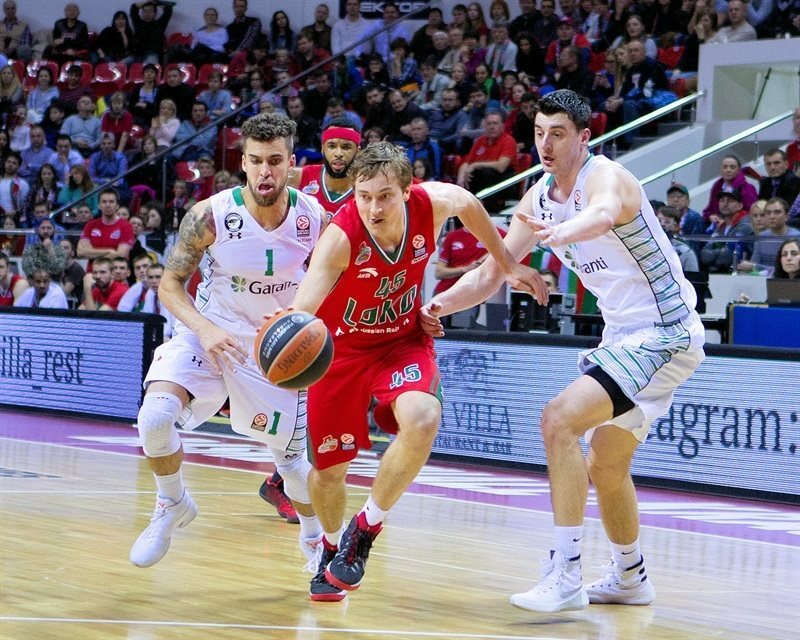 Broekhoff snapped Lokomotiv’s drought, beating the shot-clock with a three-pointer after four and a half minutes in the fourth. 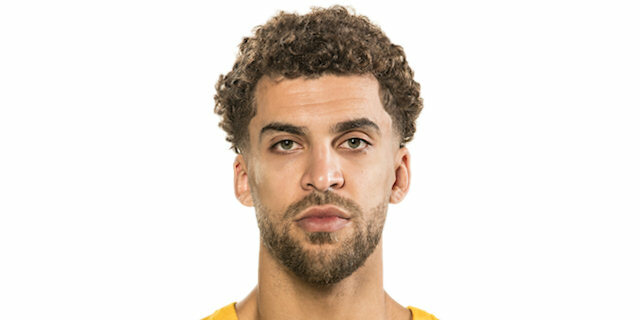 Wilbekin remained hot, driving twice to bank in a runner and a floater, but free throws from Broekhoff and Singleton kept the margin in double-digits, before Voronov banked a three-pointer to make it 71-54, essentially sealing the deal. Delaney’s 4 free throws and Voronov’s jumper restored a 23-point margin. Preldzic scored a second-chance basket, but Randolph buried a triple to make it 80-56. Baskets from Markoishvili and Broekhoff’s jumpers in the last minute rounded out the scoring. "This is a very important win for us. We finish the first half of the Top 16 with a very good record of 5-2. We played four games on the road and only three at home. We await the second half and expect to be better, playing hard and staying true to our mentality. I should give a lot of credit to our players. Today we should've played better in the second half, after going up by 26 points. Our reaction to their zone pressing was far from ideal. We should have moved faster on defense and offense, but we cooled down. Still we were able to adjust rather quickly and take the victory. It wasn't easy, but nothing in the Top 16 is easy." 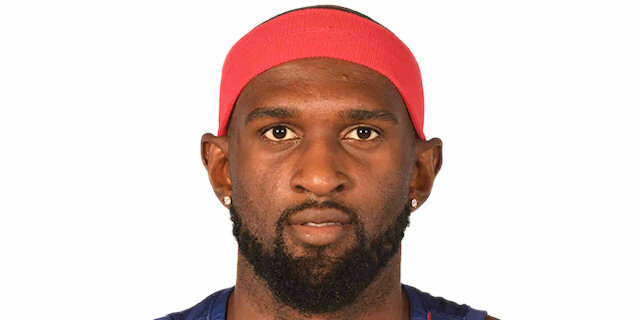 "I congratulate Lokomotiv Kuban. They were a better team and won thanks to great individual talent. There was a key moment at the end of the first half when Lokomotiv went on a 8-0 run after our turnover. 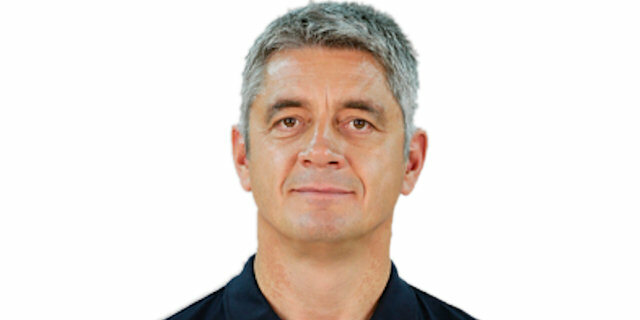 But for me as a coach, one thing is very important: our players kept fighting for 40 minutes and showed a lot of respect to the name on their jerseys." "Overall I'm glad for the win. It's a big one for us. We just need to work on playing against zone press and we are going to be good. After the third quarter we got loose, we lost focus being up 20-plus points. They turned it up, did some things we might have not be expecting. We got careless with the ball. 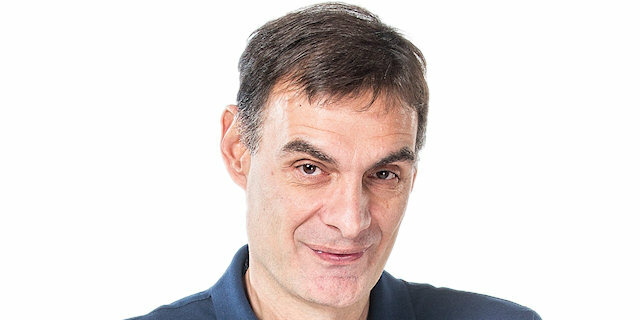 I came to this team late, and once I saw everybody play in the Euroleague, I thought we had a good chance of going far. We just have to come together. We just got another player today, we just have to keep getting better, and shooting for a championship." "It did not turn out the way we wanted. We had too many turnovers in the second half, allowed them too many open shots. We dug ourselves a hole we couldn't get out of. But we kept fighting, and that was important."